Please provide a shipping address where you want gift card sent and a message note. Please note that Gift Cards are non refundable. 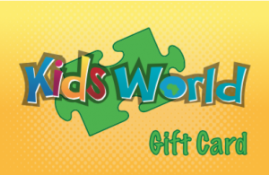 Kids World Gift Card $50.00. Please provide a shipping address where you want gift card sent and a message note. Kids World $25.00 Gift Card.